Casting director Amhalise Morgan sets her creativity free at home. Meet Amhalise Morgan, mother-of-two and longtime casting director, who also recently completed directing her first short film, These 3 Waters, which is currently in consideration at film festivals. Her two-story brownstone in the Bedford-Stuyvesant neighborhood of Brooklyn reflects her career and creative spirit as well as her free-spirited maternal side, creating clever spaces for her two teenagers. 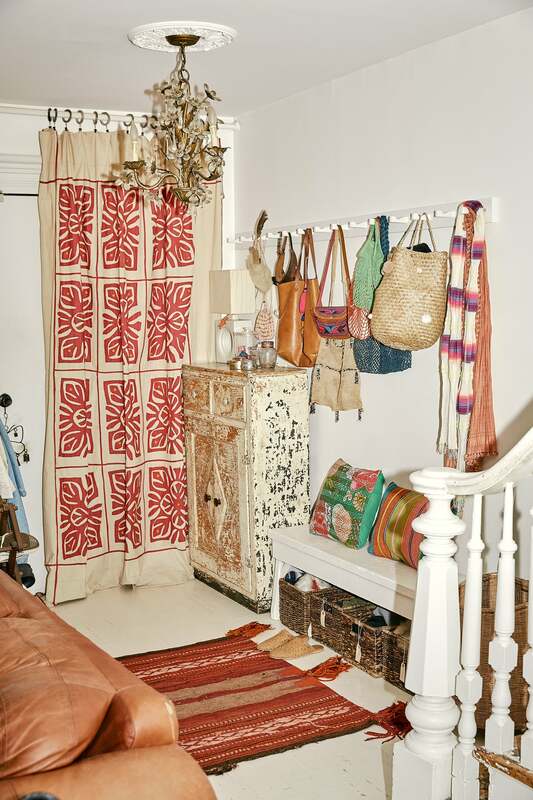 Steeped in global eclectic style with carved, collected furniture at every turn, the home is a mirror image of her Bohemian self. Ever since moving in nearly 15 years ago, Morgan has been renovating and evolving the three-bedroom, two-bathroom home. Having traveled and lived around the world, Morgan brought along a worldly collection of furniture, art, and accessories. To offset the medley of collected pieces, she painted the walls and floors white—or as she advises, enlisted someone else to properly paint it out. “It’s epoxy paint, a two-part paint, so you need to hire someone who knows what they are doing or it will turn your floors into flypaper,” she says. The clean backdrop in the living room showcases her white and wood palette right away as people come through the door. The cognac-toned leather couch is actually a sofa bed that she found on the street and then refurbished. The two seats were a pair of deck chairs a friend no longer wanted, so instead, she shined them up and threw on some shearling for an added layer. “I love neutrals of wood mixed with white because I feel you can always change things up with rugs and accessories,” Morgan says, frequently layers in Suzanis and other patterned textiles. Add in a coffee table from Jamaica, a fertility mask from the Congo, and a Franco Albini wicker stool plucked off eBay and it’s clear that Morgan knows how to mix, match, shop, and salvage. Hanging over a vintage bench (which shelters her favorite magazines) is a natural, handmade mobile—a creation she made after pulling a branch out of a lake in Upstate New York. The butterflies were collected over many years near and far from local flea markets and Evolution in Soho to trips to the Florida Keys. “They’ve hung on the wall, they lived on mantels, and this is the last way I have used to display them,” she says. Morgan’s home is a bit like her passport book, reflecting time stamps around the globe. In the entry, an Uzbeki curtain from eBay keeps the cold air out during the winter while an Old World Flea Market console houses games and office supplies near the dining room. In the kitchen, Moroccan concrete floor tiles are married with Mexican tiles in the same greens and browns on the backsplash with simple penny rounds to tie them together on the counter. The island (which houses the dishwasher, wine fridge, and additional storage) was made from old wooden 7-Up crates by Jessie Nelson of Jessie Nelson Studio. The open wood shelves show off her bowls from Tunisia and glassware collected from IKEA, the Salvation Army, and of course, her travels. For her bathroom, she went the other direction with a bright, clean look and feel via white subway tiles; then she contrasted with darker hex tiles on the floor. A soaking tub and salvaged freestanding sink look fresh paired with a warm wooden medicine cabinet, wicker baskets, and Turkish towels. More globetrotting is seen in her tranquil bedroom where a director’s chairs and vintage hides are paired with carved doors and painted Indian cabinets purchased from Camden Market during her time in London. Always on the hunt for something unusual, the dresser is an old dentist cabinet from Greenhouse & Co on Atlantic. In her son’s room, eclectic meets industrial; there’s a chalkboard wall he draws on from time to time, a rolling metal file cabinet, and a motorcycle (another found object!). The twin bed was bought on a whim in Williamsburg and the chair also found on the street—but her son got to choose the black velvet fabric when it came time to reupholster. Stacks of book are found throughout the bedrooms and into the living room where a bookshelf nods back to years of Morgan’s career. Here, among candles and greenery are photography and art books and even sentimental moments, such as the black and white felt and letter sign.